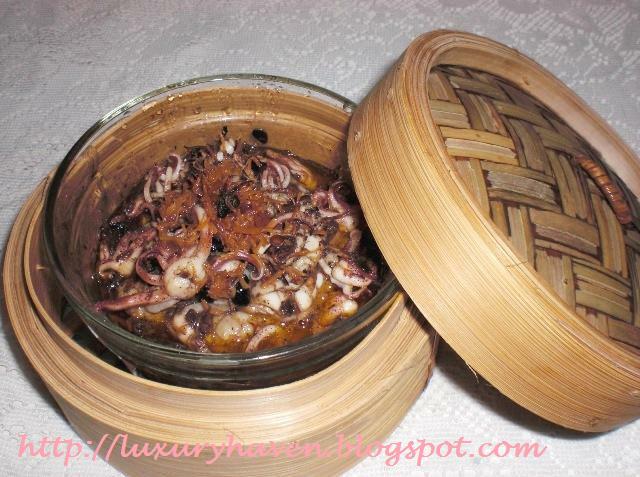 East Ocean, located just next to Isetan Scotts, serves one of the best XO Squid. This is my home-made version, added with black beans & dried scallops. I was surprised it turned out to be my guest’s favourite dish of the day. He practically finished the whole plate of Calamari by himself & asked where he can find this dish. My answer was, “You can’t find this version anywhere but only in Shirley’s Top-Dollar Restaurant”. LOL! I’d to make-do with a small tray of squids as I couldn’t find the large ones in the supermarket. Preferably, use the larger ones as the effect will be better & the outline from the criss-cut pattern will also be more prominent. 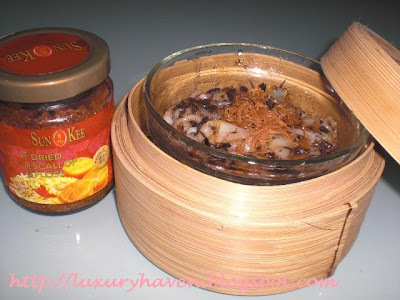 This is an easy-to-do seafood dish & it can go with either rice or porridge. 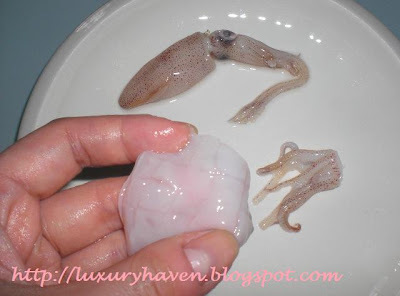 Clean & remove skin from squid. Cut squid into slices & criss-cross the underside. The pattern on the squid will show once it’s cooked. Marinade squid with the ingredients for 30 mins except cognac. Add only 1 tsp of scallop floss & keep the other tsp for topping. Steam for about 10mins or till squid turns white. Do not overcook the squid or it will turn rubbery. Add XO & serve piping hot. This looks great. I love squid. 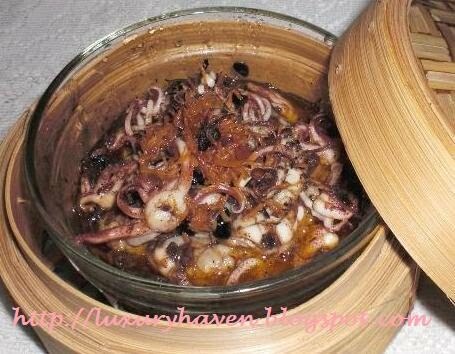 It is one of my favorite seafood dishes. looks very delicious. I think I can eat the whole plate too! Thanks for sharing. Cheers !